Manny Pacquiao has given us a reason for not taking the Floyd Mayweather fight, despite Mayweather personally calling him in an attempt to get the most anticipated bout in the sport of Boxing happen before he ships off to prison. Why? Not enough money, as in $40 million dollars not being enough. If you ask Mayweather, and even if you don’t, just follow his tweets, then it’s Pacquiao and Bob Arum who are to blame for the fight not happening. As it was becoming clearer and clearer that the two camps weren’t going to stitch up the negotiations in time, both went their separate ways. Mayweather closed a deal to fight Miguel Cotto on May 5, which is probably the second biggest fight in terms of PPV numbers, while Pacquiao will fight Timothy Bradley on June 9. While Bradley isn’t a big name and it will be his first fight coming up from Light Welterweight, he’s undefeated and a very skilled fighter. He doesn’t makes fights exciting, but he’s tough, keeps coming at you with his head and might be very troubling for Pacquiao, who had enough trouble again Juan Manuel Marquez in his last fight. If Bradley stays patient and doesn’t allow Pacquiao to dominate early on, this might be a very interesting fight. As for money, there’s no doubt that the biggest pay will be in the Mayweather fight, with Cotto getting a big sum, unlike Bradley who doesn’t really have any PPV following. 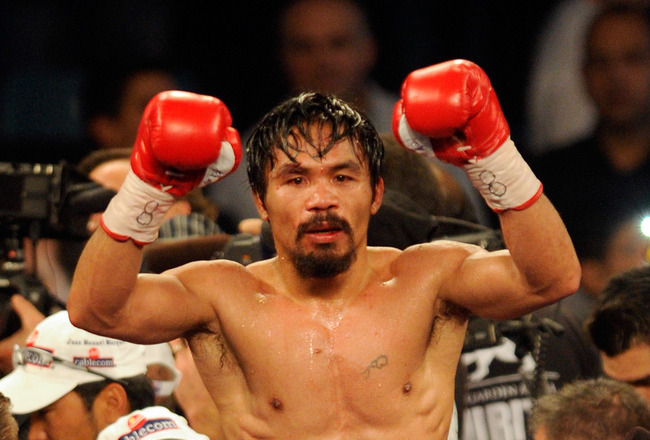 Pacquiao turned down the Mayweather offer because there was no PPV money in it – simply take $40 million, and that’s it. It sounds funny that someone would turn down such a figure, but both parties know how much money there is to be made of this fight. In general, it just looks like both of them didn’t really want the fight. Mayweather offering something he pretty much knew would get turned down, while Pacquiao, allowing Bob Arum too much control over his next fights, didn’t do enough to make it happen. He talks, he says all this, but you know what: he doesn’t want the fight. I want the fight. I’m the one who has wanted this fight all along. He offered me $40 million, and no pay-per-view money. No pay-per-view. Can you believe that? Would you do that? Come on. What would he say if I offered him $50 million – not $40 million, $50 million – and said ‘No pay-per-view. Take this money and be happy, but no pay-per-view.’ He wouldn’t do it, either.